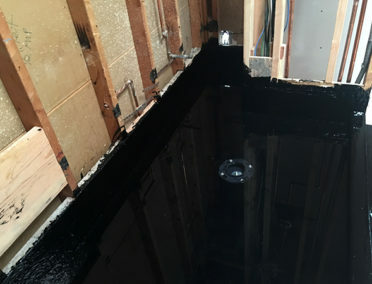 Many people in and out of the trades wanting to try and save money will tackle the “water-proofing” for there shower pan, and in certain instances it may work out that way. In this blog we will look into plastic/vinyl based “sheet good” products. Experienced tile contractors know the importance of the shower pan and take the time and effort to install a quality sheet good shower pan but rarely can that be done as cost effectively as a hot mopped shower pan done by AR Shower Pans. 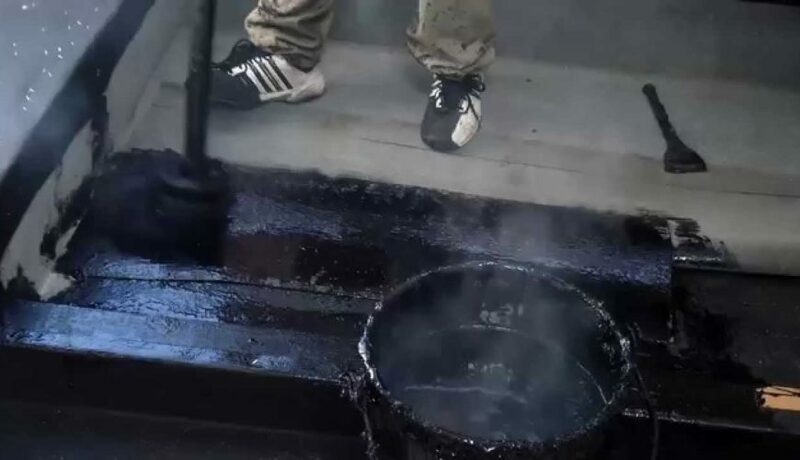 All water proofing systems can and do work, but some even when installed per manufactures instructions have there disadvantages, and as we explore the differances between some of the products currently on the market, and the disadvantages they may impose. We at AR Shower Pans offer one of the oldest time tested methods for a very competitive price, with a faster install time, backed by a company with 100,000+ hot mopped shower pans completed in its company history! All insurances and work mans comp. up to date. The very best in customer service in the field and in the office! In this blog we will look into “sheet good” products. For instance the use of CPE, vinyl, or other “sheet good” products is used by many as it readily available at tile and retail outlets. We all know how easy it is to install anything per “per manufactures instructions!”. Experience and repetition of practices makes a products performance work!. Any 1st time or limited experience with a product application will have its challenges and setbacks and sorry to say maybe the infamous statement “it should be okay?”. For instance folding the inside corners of sheet goods is trying at best! No slicing, cutting is allowed without the use of additional material being bonded to the surface most companies produce pre-fabracated pieces espeically made for these areas which will need special attention to insure a proper seal, folded inside corners also leave a large “bulge” in the corner which if not taken into account can cause issues with the setting of the tile. Also if not folded correctly it made trap water, never a good thing as the shower itself works on the principal of water in and water out. Allowing no areas the chance of mold growth. Most companies add a anti-microbial ingredient to help prohibit growth. This is an example of what should not be done! Cut corners and staples below the curb. All covered with the glue that bonds the material together. When you come to the “Curb” of your shower pan a cut will have to be made for it has to be “rolled” over properly…this is where specialty corner pieces will have to be bonded to your sheet goods, usually with a liquid cement provided by the manufacture. If your shower pan is too large for the products width you will have to “bond them together” and let “cure” prior to install. Also bonding to the shower pan drain, and making sure the clamping ring is securely sealed. Again tube caulking and/or adhesives will be needed here also. Remember that the pre-slope will have to be done and if using a cement based product, it will have to be allowed to set before you can begin. Getting a flat piece of 30 or 40 mil “sheet good” material to lay down on the shower pan flooor, roll up the walls, up and over any benches and curb, all with folds and added glued on corners takes a fair amount of skill and practice! To be able to give its best performance. Or at the very least you will need plenty of patience!. Contractors that do use “sheet good” liners know what it takes to install a proper pan liner and their cost to install will show just how much effort and time it takes to make sure they have a trouble free shower pan liner. Compare it to a Hot Mopped shower pan installed by AR Shower Pans!!!. As you can see everything on a Hot Mopped pan is crisp and clean! No waves or bumps no bulging corners. All adhered to its pre-slope and backing not just lain on top or hanging by nails! Curb hot mop is tight and bonded to the wood. Our field technicians will provide you with the best labor practices available, all our employees are in house trained and have a long history with AR Shower Pans. No quotas or piece work pricing all technicians are hourly with one mission in mind; Do the best job every job. Hot mopped shower pans will provide you with the very best protection at a competitive price. AR Shower’s gives you the ultimate pan liner, made to order for any size and any shape. Before mopping, I always make sure to protect the area outside of the shower stall, so that in the end, you get a nice clean Hot Mop job, and the tar is only where it should be. Also, before mopping, the top flange of the drain is removed. Hot Mop must always sit between the two drain flanges. The Hot Mop consists of Three Layers Of 15# felt paper, with hot tar before, between, and after each layer. In Starting the Hot-Mop process, you can see the first layer of Hot Mop being installed. My Hot Mop corners are always very tight, with no air space underneath them, making the Hot-Mop very hard to damage, and also makes a nice surface for the Tile Man to work over. After the three layers of felt are in, fiberglass mesh is put in the corners to strengthen them. The top flange of the drain is then put back on, sandwiching the Hot Mop between the two flanges, creating a water-tight seal ( Fiber-glass mesh and top flange of drain are installed). After all of this is in, a final coat of Hot Mop ( called the “flood coat” ) is mopped over the entire shower pan, being sure not to get any in the Weep-Holes of the drain ( Finished Hot-Mop with no tar in the Weep-Holes ). The Weep-Holes are small holes located on the top flange of the drain assembly. With a proper Pre-Slope, and by not clogging the Weep-Holes, any water that reaches the Hot-Mop will work its way toward the Weep-Holes, allowing it to escape into the drain line. After the flood coat is finished, clean up is done, and the shower pan is filled with water to test for leaks. The final product is a 100% water-proof Shower Pan guaranteed to pass city inspection. Once the hot mop is complete the mud for the tile setting bed must be prepared. We have seen most mud beds floated with a premixed mortar or a custom mix of three parts sand and one part Portland cement. However, before floating the mud bed over the hot mop make sure to keep the weep holes at the base of the drain protected with gravel or crushed tile (read our article on Weep Holes to learn more). Also, most local codes call for the mud bed to be reinforced at the approximate center of the base. This is most easily accomplished laying a custom cut piece of metal lath over the floor before packing your mud. Once the mud setting bed is complete the wall moisture barrier is put up on the walls. Start by flashing the water barrier (typically asphalt felt paper) over the sides of the hot mop so that all moisture flows into the shower pan. The backer board or wall float should come down to your setting bed on the floor. Make sure to not puncture the hot mop below dam level along the walls. This means no screws, nails, or staples below the dam level—puncturing below this level can compromise your shower’s water threshold (think flood levees or river dams with a hole half way up—not good). Once the mud is dry apply the thinnest and tile. Once the tile has been set you can apply the grout and sealer. Once the grout and sealer have been applied, the shower pan should look like the diagram below. Note that the same steps apply to vinyl liners as to hot mopped shower pans. When setting the Shower Pan Drain, be sure to set the “flat area” of the bottom half directly on the sub-floor surface, as shown in the Image to the right. “Blocking” around your shower stall is required to give the Shower Pan a solid surface to sit against, and also protect it from careless tradesmen who might otherwise knock a hammer or other instrument through the Hot-Mop membrane. “Blocking” is best done with 2″x10″ or 2″x12″ boards cut to fit between the studs. See the Image to the right. The “Curb”, also called the Damn, is the area that will serve as the entrance to your shower stall. “Curbs” are usually built by stacking either three or four 2″x4″s on top of each other. The minimun height requirement for a curb is 4 1/2″, although some people prefer the look of a higher curb and may build it 6″ or even 7 1/2″ tall.
" My experience with Construct is absolutely positive. The themes are beautifully designed and well doc-umented. Construct provides quick and competent support." A “AR shower pans” is unique &amp; special design of bathroom showers. It has a one of the best and quality materials in our company. Easily will get our location and can to be find out a different location...! After building or stripping the walls of the shower, you can utilize a combination of liquid waterproofing adhesive and tightly woven reinforcing membrane to make the area surrounding your shower immune to water damage. SEO & Website Development by Best Net Placement. All rights reserved.